The film begins with flickering black and white images on a small square screen, as if we are seeing someone's old home movies. The images are of Britain on the eve of WWI, and of men signing up at recruitment centres, being equipped by the army and carrying out their basic training. There's no formal narration and nothing else to guide us, just the images and the voices of the soldiers themselves, something that makes this film all the more immersive. 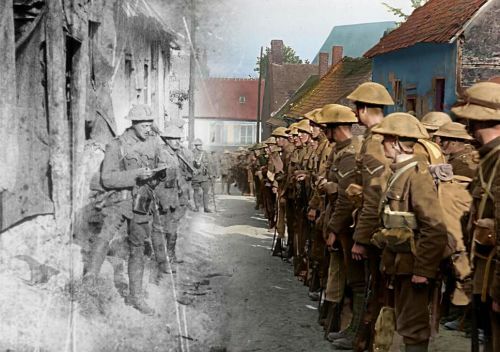 They Shall Not Grow Old's greatest moment and cleverest idea, occurs about 25 minutes in. With the men now arrived at the front, the screen size gradually expands to fill the frame, and the black and white images turn into full colour with sound. It's a very striking and memorable moment. The men in the film are no longer distant, flickering images, but real people who look back at you, sometimes directly at you, from a century ago. It looks almost as if it could have been filmed yesterday, and the result is startling. To produce this effect, every frame of film had to be hand coloured and digitised. Just as importantly, original film footage from this era runs at around 16 frames per second, which gives it a jerky, slightly comical look when projected at contemporary speeds of 24 frames. So Jackson's team used computers to build interstitial frames to make the movements more fluid and natural. 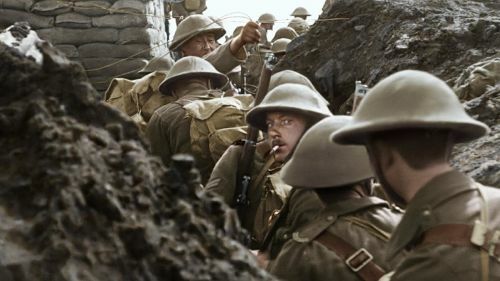 Sound effects have also been added to the footage – the sounds of tanks moving, horses galloping, guns firing – and forensic lip-readers were used to work out what the soldiers in the footage were saying, and actors were then used to voice their words. All of this gives the film an almost palpable, and certainly unexpected, sense of immediacy. Perhaps disappointingly for the makers, though, the soldiers most often seem to be looking at the camera and calling out “Hello Mum!” or pointing out the camera to their comrades, a reminder that turning a camera on someone tends to draw attention to itself and to create its own reality. The film is not a strategic view of the war or even of the war on the Western Front. Audiences will not learn much about how and why the war started or the strategies used or even where else it was being fought. 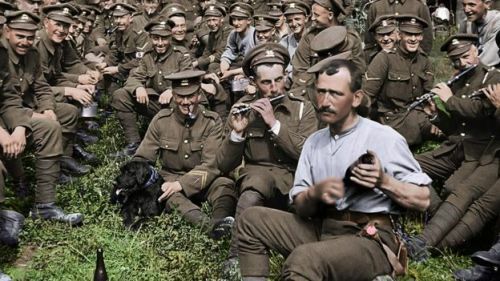 In that regard, They Shall Not Grow Old will help to reinforce the view of the First World War as something that happened in the trenches of Belgium and France, instead of a world war that also took place from Mesopotamia to Western Africa to the South Atlantic. But there's a reason why the trench warfare on the Western Front has become the default image of the war, because that was how so many people experienced it, and it was by far the most important conflict as far as British soldiers and most of their western allies were concerned. There's no mention of the role of aerial warfare, a new and potent weapon in WWI, although there is a fair bit about the new development of armoured warfare, with the British army shown first using tanks on the Somme in 1916 and, of course, of the effects of gas attacks, a new and unwelcome development in warfare in WWI. What the film does do is to humanise those who took part in the war and turn them from statistics back into human beings. The interview snippets are fascinating and well chosen. We learn the basics of how trench warfare was experienced; the mud, gas, lice and rats, the ever-present stench of death, the corpses of men and horses all around, the devastating effect of machine guns on the advancing troops, and the possibility of sudden and random death at the hands of an enemy sniper. Some interviewees tell of comrades falling into the mud and being sucked under to their deaths. Some of the film is inevitably grim, with footage of blackened corpses and gangrenous body parts, but it could easily have been far worse. Some scenes are more subtle but tell their own story, like the soldier walking towards the camera with one hand visibly and uncontrollably shaking. We also learn that the British soldiers felt remarkably little animosity towards their German counterparts and that they in fact respected them as adversaries. We see captured German soldiers sharing cigarettes with their captors and helping on stretcher bearing duties. The interviewees also point out the animosity between the different groups of German soldiers. Germany had, after all, only been a nation state for just over 40 years, and regional rivalries between Saxons, Prussians and Bavarians were still strong. The interviewees make clear their enthusiasm for the war in the early days. People were much more patriotic then and more trusting of governments and authority. Many recruits were fleeing dull lives and boring jobs or unemployment, and they were probably better fed in the army than they were in civilian life. They also tell us how recruiting officers would connive with under-aged recruits, who were eager to sign up, but were only 16 or 17, instead of the required 19. Some were told to “Go outside and have a birthday”, and others prompted to give the right answer (“You did say you were 19?”). Given that it's made up almost entirely of footage filmed by other people and audio interviews recorded by others, it's ironic that They Shall Not Grow Old is one of Peter Jackson's best films. It's an excellent example of how to take archive film footage and audio recordings, reinvigorate them and present them to a new generation. Some archivists and historians have quibbled about exactly what Jackson has done with others' footage and that his use of grainy imagery early on in the film presents the archive film as being in much worse condition than it really is. 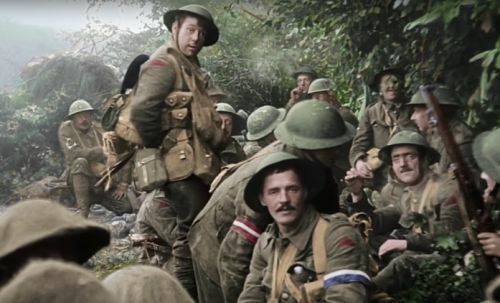 Some of the footage comes from The Battle of the Somme (1916), one of the blockbusters of the WWI era, which was painstakingly restored by the Imperial War Museum and re-released into cinemas as recently as 2016. What Jackson has done is not restore the footage, but to re-imagine it, to create something new. Not something wholly authentic, colours and sounds have to be guessed at to some extent, but something fascinating and worthwhile all the same. Even if it's an approximation of reality rather than actual reality, They Shall Not Grow Old is a moving and immersive experience. After we have seen the soldiers in full colour and heard the testimonies of the survivors, the film draws to a close. As it does so, the screen retreats back into a small frame, the colour pictures return to black and white, and the images take on that distant quality again. Flickering images of long-forgotten soldiers moving jerkily along, marching back into the past. Great review of one of the few new films I'd like to see this year. I just haven't been able to bring myself to watch it yet so far. But I will. It sounds absolutely harrowing. WWI is the forgotten war. No. 2 gets all the glory, in a way understandable. But WWI could have been avoided. Strangely enough, it isn't that harrowing, There's some dead bodies and stuff but not that many and what really comes across is people's stoicism and cheerfulness, their camaraderie, and the fact that people could even enjoy the experience to some degree. WWI will always be overshadowed by WWII in the American consciousness, but there does seem to be greater interest in it in Britain in recent years, even before the centenary.